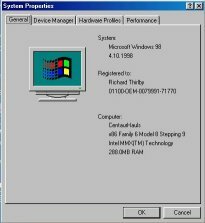 In my last review I coupled together a Via C3 933MHz processor together with a Shuttle SV24 in an attempt to create a silent HTPC. As impressive as the C3 was in cooling terms it just didn't quite have the grunt to run DVD's without skipping the occasional frame. But now the C3 has hit the magic number of 1000MHz! 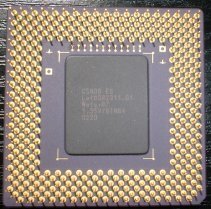 On first impressions the new layout of the C3 1GHz is not dissimilar to an AMD Athlon or Duron processor in appearance of cache chips now being on top of the ceramic rather than hidden away. I can only presume this is to with cooling within the CPU. 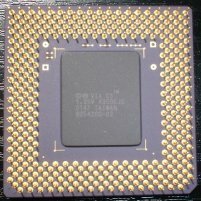 The ceramic now also displays what appear to be "bridges" as seen on AMD chips; these are not present on any of the previous C3's. Fitting the CPU can be very tricky as the large core reduces the amount of leverage you have on the heatsink clip. 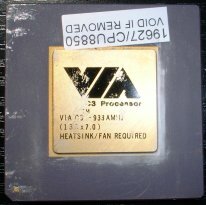 As you can see from the picture above of my 933MHz C3 it is very easy to damage the ceramic when levering on a heatsink. 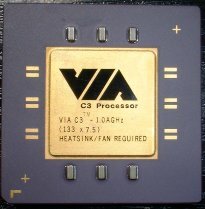 The heatsink supplied with the Shuttle is not suitable for the C3 at all as the clip is excessively strong and is the heatsink which caused all of the damage to the 933MHz chips ceramic. Because of this I will use a standard Taisol heatsink without its fan. It is roughly 3 times the size of the shuttles heatsink so should aid in cooling. 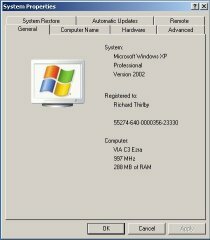 VIA provided no technical information with this CPU so I presume that they are still using the Ezra core although in Windows 98 the chip is named "CentaurHauls" and in Windows XP as "Via C3 Ezra"